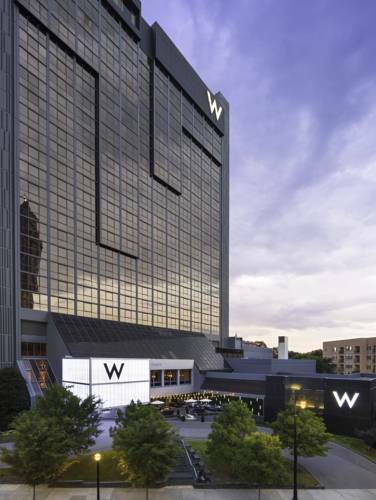 Experience Atlantas limitless possibilities at W Atlanta Midtown. Step out our front door for access to the city's most dynamic neighborhood, picturesque Piedmont Park, and world-class shopping, dining, culture, and nightlife everywhere you turn. See and be scene in our Living Room, enjoying live music over craft cocktails, or savor Southern flavors in a welcoming space at TRACE. Our new and renovated rooms, just as bold as the streets, feature unmatched floor-to-ceiling views of the Midtown skyline. Make some time to indulge at The Spa at W Atlanta Midtown, relax at WET, our rooftop pool with a bar and cabanas, or work out at FIT, our 24/7 high-tech gym. Let our fluid event spaces set the stage for out-of-the-box meetings, weddings, and gatherings, perfectly accented with custom catering and expert services. Whether staying with us for a getaway or for business, let us show you how electric Atlanta can be at the most coveted hotel in Midtown. TRACE: Savor New South favorites in our Midtown restaurant, with cuisine crafted from peak-of-the-season ingredients from local, renewable origins and served with Southern Hospitality.